KARD is unique in many ways. They’re finding unprecedented popularity for a co-ed group but that’s not the only reason they’re so much unlike any other K-pop act. While co-ed groups have existed before — to varying degrees of success — and will likely continue to show up here and there, none of them have resembled the marketing strategy of KARD. It’s becoming clear that no K-pop act in history has rivaled KARD in its ambitious overseas marketing at such an early stage in a group’s career. Which raises the questions: Is KARD breaking K-pop? That is, has their avant garde marketing strategy struck such a nerve with K-pop fans that it begs to be replicated? Promoting overseas isn’t a trait that’s specific to KARD alone. In fact, many groups during what’s considered the Golden Age of K-pop (2009-2012) focused heavily on overseas promotions, specifically in Japan. Ever since the decline of the Hallyu wave in Japan, and more recently in China, K-pop groups have returned much of their focus onto the domestic market. However, KARD is doing the exact opposite. Instead of focusing on Korea, they’ve put much of their efforts into appealing to fans overseas. And instead of treading into the usual K-pop stomping grounds of East and Southeast Asia, KARD turned its attention to the West. The Wild KARD Tour in San Francisco marked the group’s final stop in the US and it’s just one of a litany of stops since the group started touring in early May, which at the time was less than six months since the release of their first single. Over the course of the following five months, the group performed in countless cities across the Western hemisphere, making multiple stops throughout North America, South America, and Europe. During this time, KARD also made their official Korean debut with “Hola Hola” by performing for the first time on music shows. This video from Popsori does a good job of summarizing KARD’s rise in international fame. Hats off to the people at DSP Media who clearly thought outside of the box in their promotional strategy with KARD. Having cashed in heavily on Kara’s run as arguably the most popular K-pop girl group in Japan, DSP understands the importance of overseas promotions. In fact, KARD member Somin first debuted as a member of Puretty, a girl group that promoted only in Japan and never debutted in Korea before disbanding. I wrote back in January that I thought this company was in serious trouble given the lack of revenue-generators on their roster after the departure of Kara and Rainbow, but they have truly hit a home run with KARD as the group is undoubtedly bringing in immediate profits in just their first year active. As a matter of fact, interest towards this group seemed to be at an all-time high when I stepped into a sold-out venue for the show. Every single seat in the theater was occupied, and I mean that literally because every ticket came with a seat. I thought it was an interesting choice to have actual seats at the front of the stage. I’m not sure if that served an actual purpose though because those seats went mostly unused once KARD took the stage. KARD appeals to international fans in several ways and one of them is by using English in their songs. Opening the show with the English version of “Don’t Recall,” KARD shows right away that they care far more about the international fandom than anyone else. 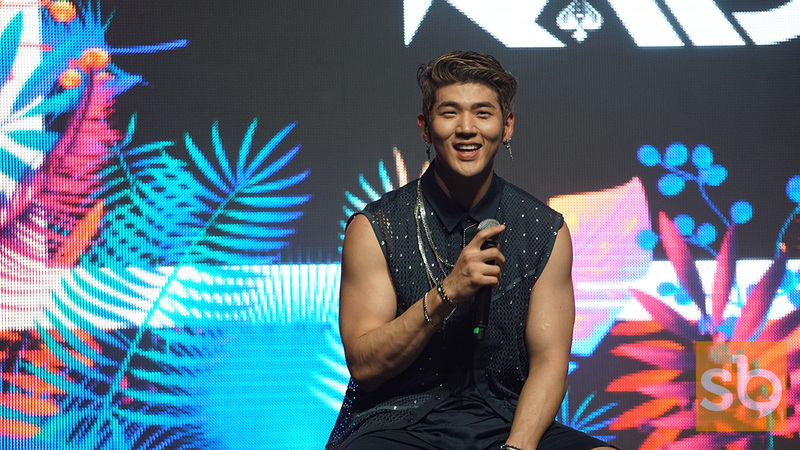 Unlike other groups which tend to treat international fans as secondary, KARD’s marketing strategy has put international fans first and, as evident, international fans have returned their love in droves. Another reason international fans are drawn to KARD is because the members show that they’re just like us. Following the first set of songs was a variety segment where the members each went around answering fan-submitted questions. One of the more memorable responses was when the group was asked what concerts each member has been to. The two clear-cut answers were FNC Kingdom and AOMG. This was rather fascinating because you rarely hear K-pop idols discuss other K-pop acts, much less attend the family concerts of competing agencies. This aspect resonates with international fans who are largely multi-fandom, and so it’s refreshing to hear that idols are also fans of multiple K-pop artists. In doing so, it undercuts the stereotype that K-pop fans must be loyal to a single fandom. It counteracts the rabid fan culture of stanning your bias and adheres to a more level-headed appreciation for the music and performances. A second reason for the group’s international success is that the marketing appeals to both genders. As the night went on, the group performed various covers of English songs and played variety games which included the participation of a few lucky fans. Another memorable moment was when the MC, Danny Lim, pointed out that there was a fair amount of male and female fans in attendance which is actually quite a rarity at most K-pop events. He’s hinting at the heteronormativity of the marketing strategy behind most K-pop groups, where male groups are marketed to female fans and vice versa. In the case of KARD, that heteronormativity is still very much in play but it’s being deployed on both male and female fans simultaneously. That’s likely the biggest draw with KARD; they attract both genders equally and so they bring in twice the number of fans. The math is undeniable. As the group performed their final set of songs and an encore, I couldn’t help but think what a long journey this has been for KARD. It’s been roughly ten months since anyone has even heard of the group and they have already held packed concerts in close to 20 cities throughout the US, Canada, Mexico, Brazil, Argentina, Chile, Peru, Portugal, Spain, Italy, and Amsterdam. That’s more concerts held in the West than what even the most successful of K-pop groups ever dare to attempt over the course of their careers, and all of this occurred over the course of five months! This brings me back to my original question: Is KARD breaking K-pop? It remains to be seen if other companies can successfully replicate this formula. There are many factors which stand out but the most significant features of this group comes down to: 1) They are a co-ed group which appeals to both genders simultaneously, 2) they draw their fanbase from international fans in the Western hemisphere, and most importantly, 3) they tour feverishly in places that do not traditionally attract a ton of K-pop acts. If this business model continues to find success, other companies will start taking notice and the future of K-pop will look noticeably different. For once, K-pop fans residing in in the Western hemisphere don’t feel like we’re being ignored and that is likely the single biggest driver of KARD’s success. They’re showing that there is a viable K-pop market here and that other companies would be making a mistake to continue to ignore it. In that sense, I believe this group has broken through the K-pop industry’s traditional business model — of marketing mostly at home and to countries in Asia — by pioneering a new marketing strategy that has allowed the group to gain an inordinate amount of exposure to Western audiences. I like to thank SubKulture Entertainment for bringing KARD to the US and for being an accessory to KARD’s worldwide takeover.